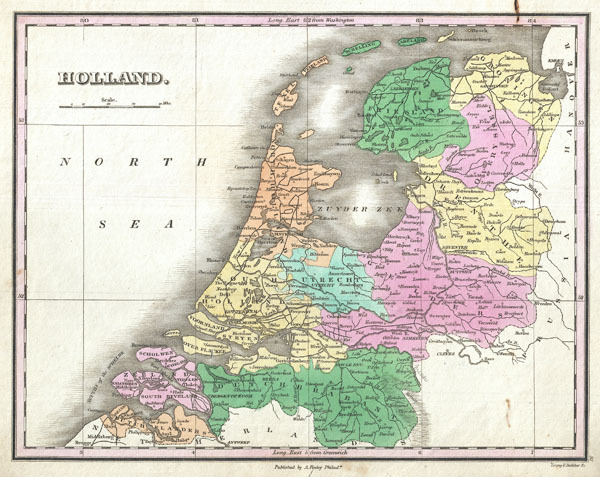 A beautiful example of Finley's important 1827 map of Holland or the Netherlands. Covers the region Friesland south to Dutch Flanders and Brabant. Identifies numerous cities, river systems, swamps and canals. Title and scale in upper left quadrant. Engraved by Young and Delleker for the 1827 edition of Anthony Finley's General Atlas. Anthony Finley (August 25, 1784 - June 9, 1836) was an American book and map publisher based in Philadelphia, Pennsylvania. Finley was born in Philadelphia in 1874. He opened a bookshop and publishing house at the Northeast corner of Fourth and Chestnut Street, Philadelphia in 1809. His earliest known catalog, listing botanical, medical and other scientific works, appeared in 1811. His first maps, engraved for Daniel Edward Clarke’s Travels in Various Countries of Europe, Asia, and Africa also appear in 1811. His first atlas, the Atlas Classica, was published in 1818. He soon thereafter published the more significant A New American Atlas and the New General Atlas…, both going through several editions from 1824 to 1834. Although most of Finley's cartographic material was borrowed from European sources, his atlases were much admired and favorably reviewed. In addition to his work as a printer, Finley ran unsuccessfully on the 1818 Democratic ticket for Philadelphia Common Council. He was also a founding officer of the Philadelphia Apprentices’ Library, and a member of both the American Sunday-School Union and the Franklin Institute. Finely was active as a publisher until his 1836 death, apparently of a 'lingering illness.' Shortly thereafter advertisements began appearing for his map business and plates, most of which were acquired by Samuel Augustus Mitchell. Finley, Anthony, A New General Atlas, Comprising a Complete Set of Maps, representing the Grand Divisions of the Globe, Together with the several Empires, Kingdoms and States in the World; Compiled from the Best Authorities, and corrected by the Most Recent Discoveries, Philadelphia, 1827. Very good condition. Original pressmark. Blank on verso. Rumsey 0285.038 (1831 edition). Phillips (Atlases) 4314, 760, 752, 6045.